Today, we want to showcase an awesome kids gas powered pocket bike by Rosso Motors. One of the first things that you’ll notice about the F1 Racer pocket bike are the cool graphics. 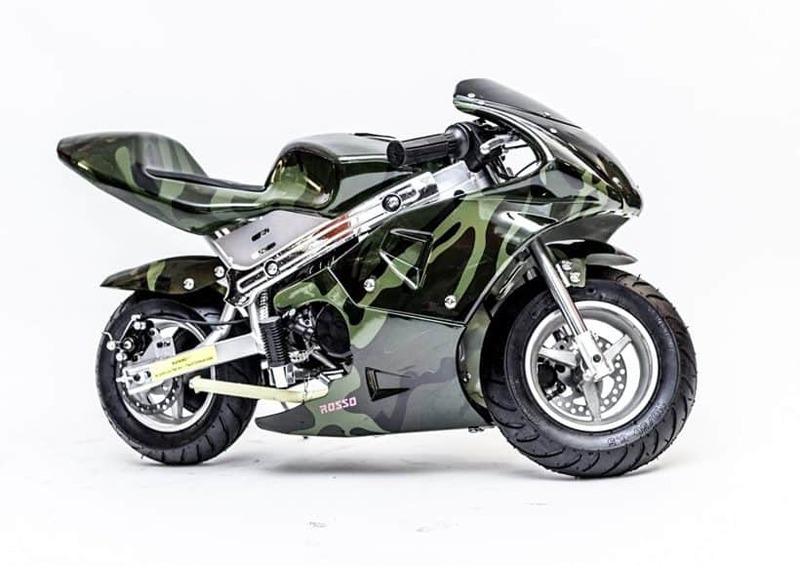 This particular pocket bike comes in gray camo, green army camo and red/black color schemes. The F1 Racer has a nice top speed with a really good range on a full tank of gas. Be sure to also check out our reviews of the eQuad S and eQuad X kids electric quads from Rosso Motors. 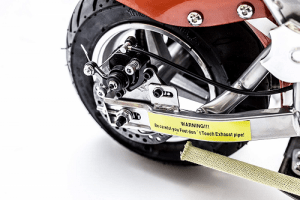 Who is the F1 Racer Kids Gas Powered Pocket Bike designed for? The Rosso Motors F1 Racer pocket bike is designed for kids ages 13 and up with maximum rider weight of 165 pounds. Adult supervision is always required when operating this motorcycle. How big is the F1 Racer kids gas powered pocket bike? What is the top speed of this Kids Pocket Rocket? The top speed of the Rosso Motors F1 Racer pocket bike is 15 mph with a drive time of 20 miles per tank of gas. 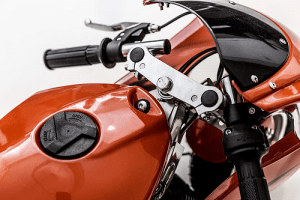 How much does the Rosso Motors F1 Pocket Bike cost? This kids gas powered pocket bike is going to run you under $350. Here’s a closer look at the handlebars, twist grip throttle and brake lever setup on the F1 Racer. This is a closeup of the F1 Racer rear disc brakes. So what are you waiting for? Get your F1 Racer gas powered kids pocket bike TODAY! Be sure to check out some of the other great mini bikes brought to you by Wild Child Sports!